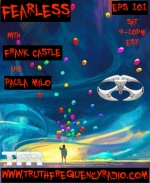 This week Frank Rants about dealing with energies, dealing with the Beings, and self responsibility, WHY???? ALL THIS AND SO MUCH MORE..! Set Your Intention and Tune in LIVE..!